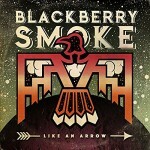 Share the post "Album review: BLACKBERRY SMOKE – Like An Arrow"
Blackberry Smoke are back with the follow-up to last year’s ‘Holding All The Roses’, an Album of the Year selection here at GRTR! and a rare five star album from me. So no pressure then lads… No need to really worry as Blackberry Smoke have produced another fine set of tunes and each one holds its own delights. Opener ‘Waiting For The Thunder’ is a classic Blackberry Smoke tune, blues rock guitars, the distinctive vocals of Charlie Starr and tasty Hammond playing from Brandon Still. They up the pace on the good time rocker ‘Let It Burn’ (shades of the Georgia Satellites on this one) and then there is the personal ‘The Good Life’, a song recalling the advice given to Charlie Starr by his dad. Again they nail it musically, from the slow backing and the sublime guitar solo midway through, along with a storytelling lyric that the band do so well. ‘Sunrise In Texas’ sounds as you’d expect given the song title, with a gentle electric piano intro and vocal, until the band kick in with a slow, wistful groove. Perfect laid back music. They haven’t lost their rock side as ‘Workin’ For A Workin’ Man’ would give Lynyrd Skynyrd a run for their money. This one and ‘Waiting For The Thunder’, sound tailored made for the live shows. ‘Free On The Wing’ closes the album and they are joined by Greg Allman on backing vocals. The piano and slide playing on this recall those classic 70′s southern flavoured rock albums. Although clocking in at nearly six minutes, the band never over indulge themselves with needless/endless solos, for them the melody and the song are the key focal points. This entry was posted in ALBUM REVIEWS, ALBUM REVIEWS (Mobile), All Posts and tagged album, Blackberry Smoke, classic, country, Greg Allman, Like An Arrow, review, rock, southern. Bookmark the permalink.